A few weeks ago I was driving back to St. Louis. I’d been in St. Louis for the General Assembly. I’d then travelled to Iowa City, where I had attended the Iowa Summer Writing Program. 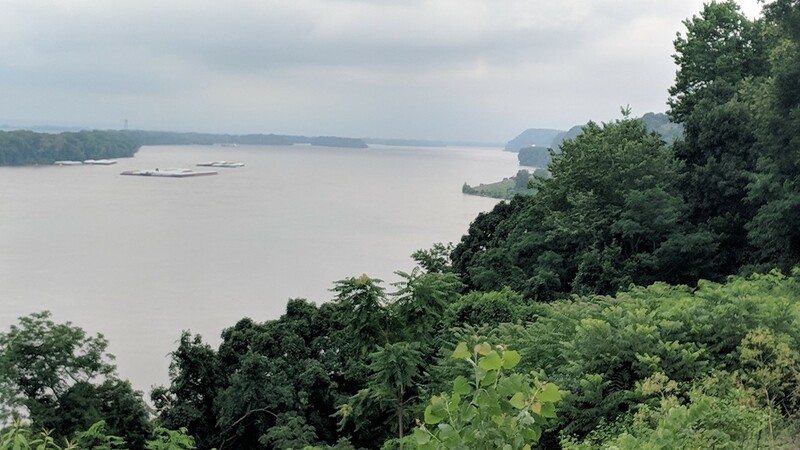 I was flying back home from St. Louis, and I built an extra day in my schedule to visit with some friends and see a few places along the Mississippi. This provided me the luxury of taking backroads. My plan was to cross over the Mississippi, from Iowa to Illinois, at Fort Madison. It’s a major rail town and I realized I had been through that town at least three times on Amtrak. It’s where the Santa Fe line from Chicago to Los Angeles crosses the Mississippi River. 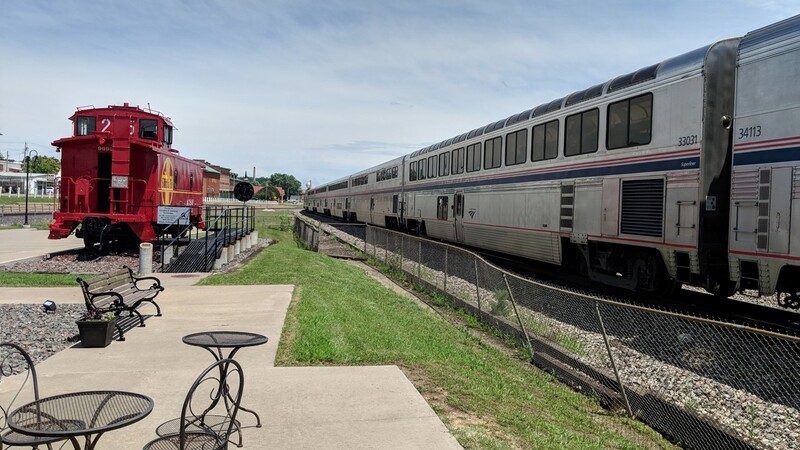 Knowing I would see plenty of trains along with barges on the Mississippi, I was drawn to the old Santa Fe depot, which is also a local museum. There, I talked to an old man passing time watching trains. He had worked for the Santa Fe, not on a train, but as a bridge tender over the Mississippi. He knew something about the railroad. I arrived about the same time as Amtrak, as it was heading to Chicago. It came to a stop, but no one got off. I was told the Amtrak station these days was a couple of miles back, but that the train had to also stop here because the bridge was open. I couldn’t see that the bridge was open, but sure enough, a large set of barges were soon visible as they were pushed down the river. When the bridge closed, the train left. A few minutes after that, a large container train made its way slowly by us. Then, as this was a double track line, a second container train raced around the first on the other line. It was booking. 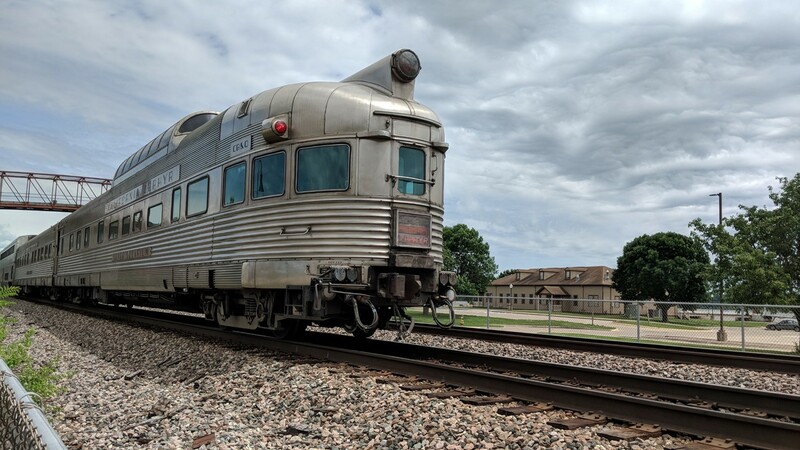 When I commented on its speed, the retired railroad guy said he thought it a land-bridge express, which hauls containers from Los Angeles to ports on the east coast, where they are reloaded onto a ship for Europe. These containers don’t go through customs and are sealed for the entire journey. Who knew! One of my metaphors for the Christian journey that I have used before is of a train on a transcontinental journey. Every ten hours or so, the train stops and one crew gets off while another takes over. 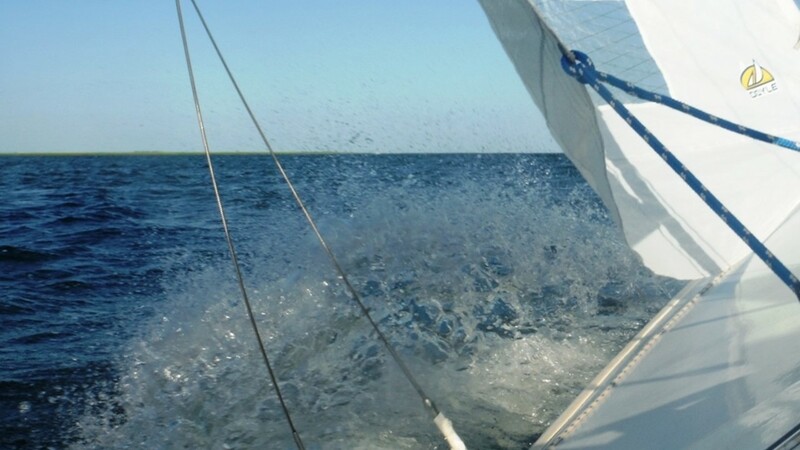 Each crew has their own particular run and responsibility. 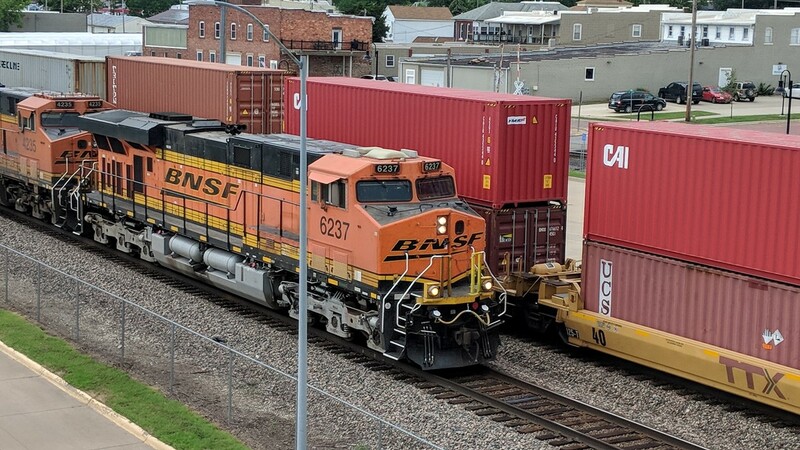 The guy at the throttle while they were crossing the Mississippi never sees the train being formed by the Pacific or its containers loaded onto a ship on the Atlantic. His or her job is to move the train safely from point A to point B. The engineer trusts that other engineers and conductors will see the train to its final journey. 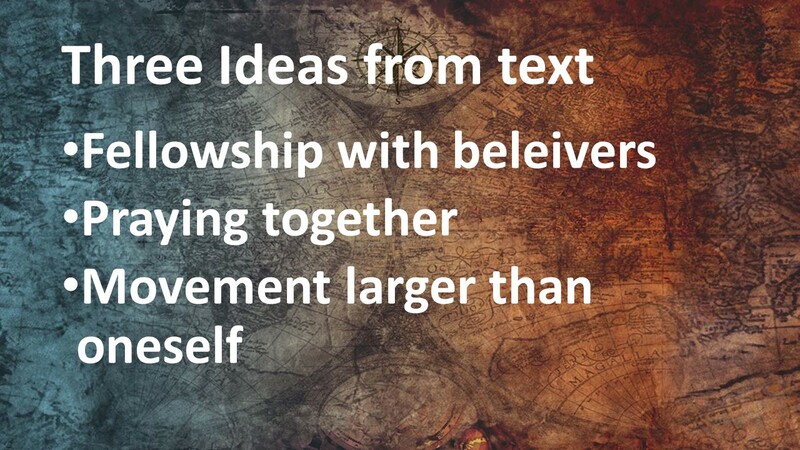 When it comes to the church, our task is to faithfully move the church a little further down the line. The church, as well as us as individuals, are on a journey. We know, or we should know, that there will be bumps along the way. 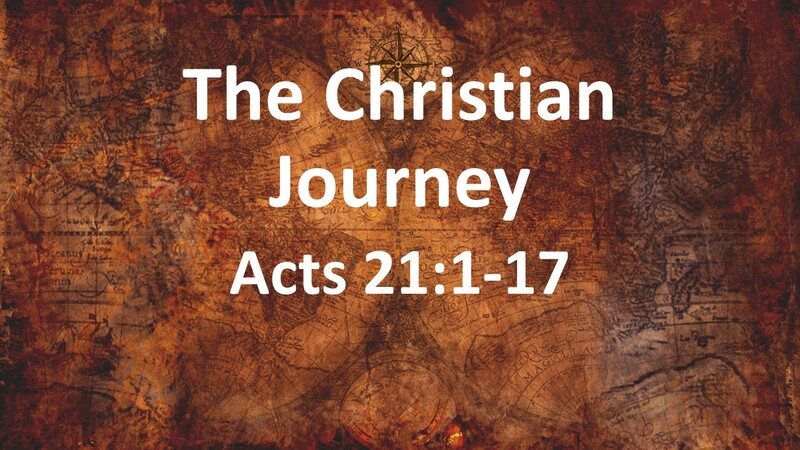 Journey has always been a popular theme within Christianity. From the early days, there were those who went on pilgrimages. These were journeys designed to draw people into a closer relationship with God. While pilgrimages fell out of favor with the early Protestant movement, the Puritan John Bunyan brought it back in the terms of our whole life being a pilgrimage. 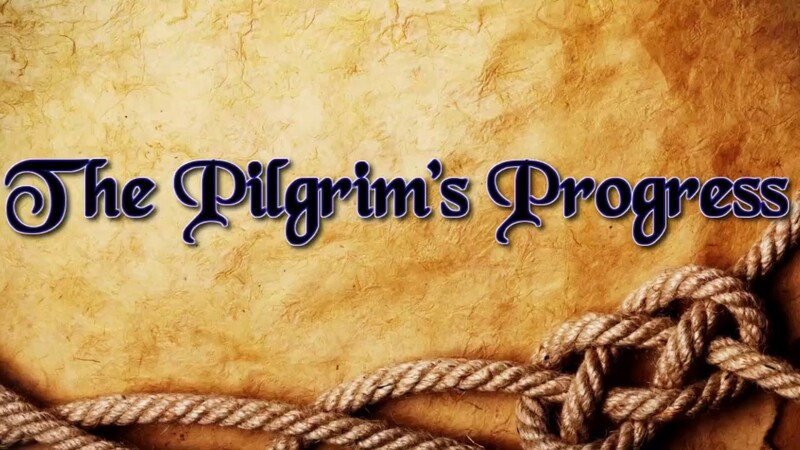 Pilgrim’s Progress is his allegorical tale. His protagonist, Christian (what a convenient name), dreams of a journey from this world to the next. Christian lived in the City of Destruction, but his journey takes him to the Celestial City on Mount Zion. 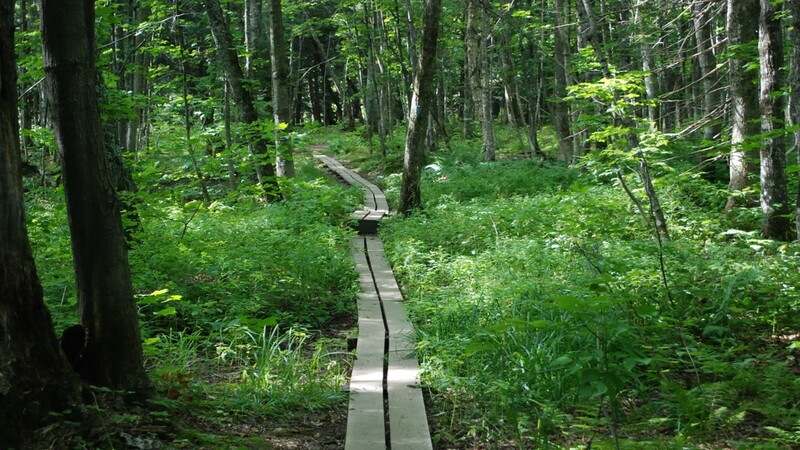 Bunyan reminds us that our ultimate citizenship isn’t to this world, but to God’s kingdom. In this fashion, we’re all pilgrims during our lives. Paul, in our passage this morning, has the same sort of feelings. He’s making the journey because the Spirit compelled him to, even though others warn him of the danger. 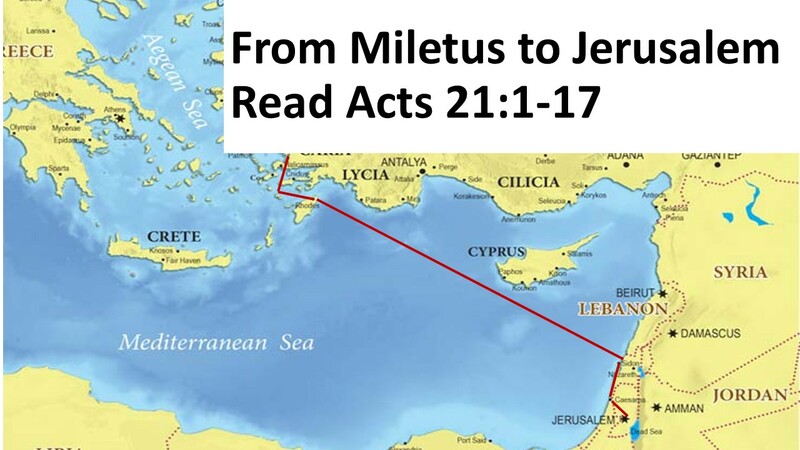 As he makes his way from the province of Asia to Jerusalem, Paul’s encounters echo many things Luke has already told us in his gospel and in the Acts of the Apostles. In Caesarea, Paul stays with Philip, the evangelists, one of the seven deacons. 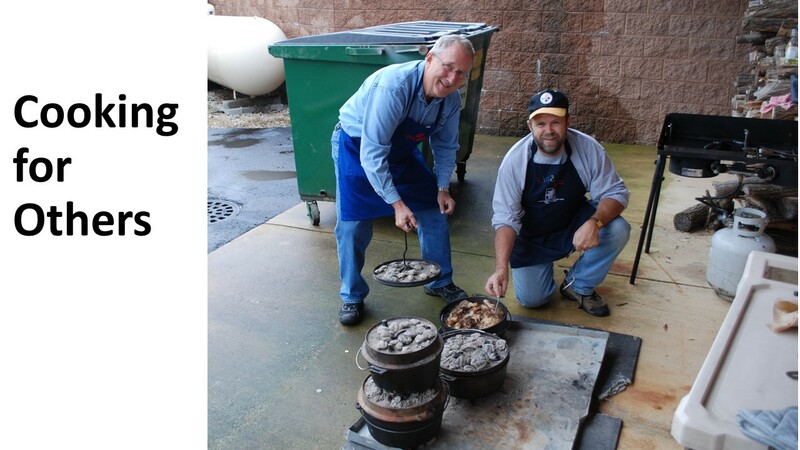 If you remember, as a deacon, Philip was assigned the task of seeing to it that the needs of all the members of the Way were well fed and cared for. One of the other deacons, with Philip, was Stephen. It was at Stephen’s stoning that we first hear of Saul, later known to us as Paul. So Philip and the former persecutor of the church, who watched with approval as one of his co-workers was killed, are now friendly. Philip has four daughters who are prophetess, which remind us of Peter’s sermon on Pentecost when he quote Joel about sons and daughters prophesying. When Paul first set out for Damascus, his mission was to bind up the Christians in Syria and lead them back to Jerusalem for trial. Now Agabus, another prophet, shows Paul how this will be reversed as Paul is bound and taken away. Furthermore, the warnings Paul receives are akin to the warnings Jesus gives the disciples about going to Jerusalem. For Paul, like Jesus, Jerusalem is a dangerous place. Despite all the warnings, Paul feels compelled by God’s Spirit to go to Jerusalem, just as Jesus felt compelled to go there. It doesn’t seem as if Paul fully knows fully what’s ahead. He doesn’t die in Jerusalem, but he was prepared to die. 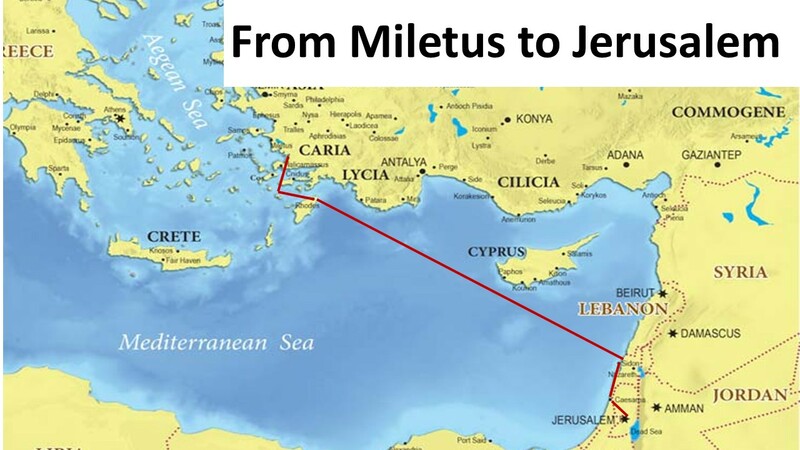 However, Paul’s ministry takes a significant twist in Jerusalem, as he is taken from there, as a prisoner, to Rome. I recently heard it said that when Christians are willing to die for the gospel, the gospel can’t be stopped. Paul knows that what he’s involved with is much larger than himself. Even though others want him to be safe, Paul knows his first loyalty is to Jesus Christ and to go to where Jesus wants him to go. There are three highlights from this passage I’d like to offer. First of all, Paul enjoys the fellowship of believers wherever he goes. The first thing he does when he enters a town is to seek out Christians and he delights in their company. Secondly, they pray together. Whenever Paul is departing, they get on their knees. In the sharing of hospitality and prayer, both parties are blessed through what they give and receive. The Christian life is of both giving and receiving, of blessings and being a blessing. The third offering for you to take is that Paul knows that imprisonment and perhaps death is ahead, but he does not fear it. Paul no longer sees himself as a free man. Paul accepts his role as a prisoner of God’s Spirit. Even though there are storm clouds ahead, Paul continues on because he feels he’s doing God’s will. It’s one thing to have trouble. Everyone has troubles. (At least I do. Don’t you?) But when we feel we are doing God’s will, we can more easily endure the pain because we know we are not alone and our purpose is larger than ourselves. It is no longer about what Paul is doing (if was about what Paul was to do). It’s about what God will do. 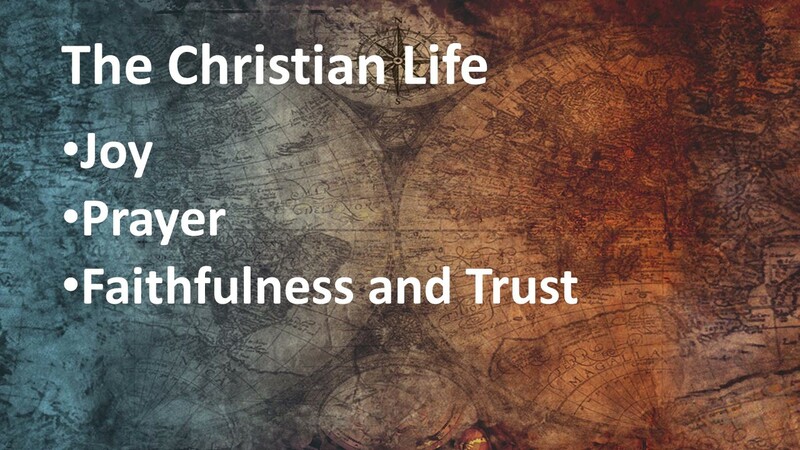 These three highlights from Paul’s journey (fellowship, prayer, and the focus on something larger than ourselves) correspond to three things within the Christian life. It’s my hope you will all strive to enjoy these. First of all, there is the joy that comes from fellowship with other believers. Secondly, when we pray together, we are connect with our Heavenly Father. And finally, we should realize that our efforts is just a small part of what’s God’s Spirit is doing in the world. We must be faithful and trust God’s Spirit to call on others to also be faithful. Holy God, help us to be like Paul. When others strive to redirect us from your purposes, give us the courage to remain focused on your mission. Help us to enjoy the fellowship of believers and to be strengthened in the prayers of the faithful. This we ask in the name among all names, Jesus Christ. Amen. Acts 18:21-22, Beverly Roberts Gaventa, Acts (Nashville: Abingdon, 2003), 291.